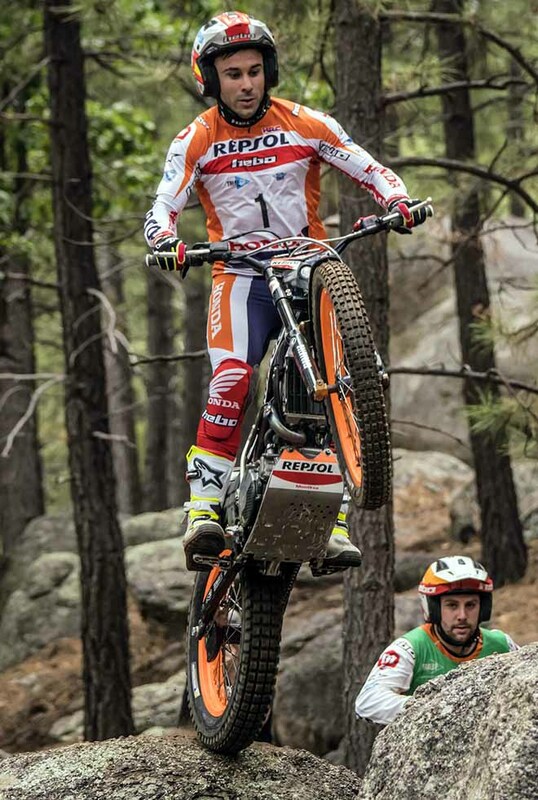 Toni Bou - Repsol Honda and Emma Bristow - Sherco completed an Uncle Sam Grand Slam in front of a packed crowd after two days of competition at TrialGP USA, round six of the 2017 FIM Trial World Championship and round one of the 2017 FIM Women's Trial World Championship, at Kingman in Arizona. 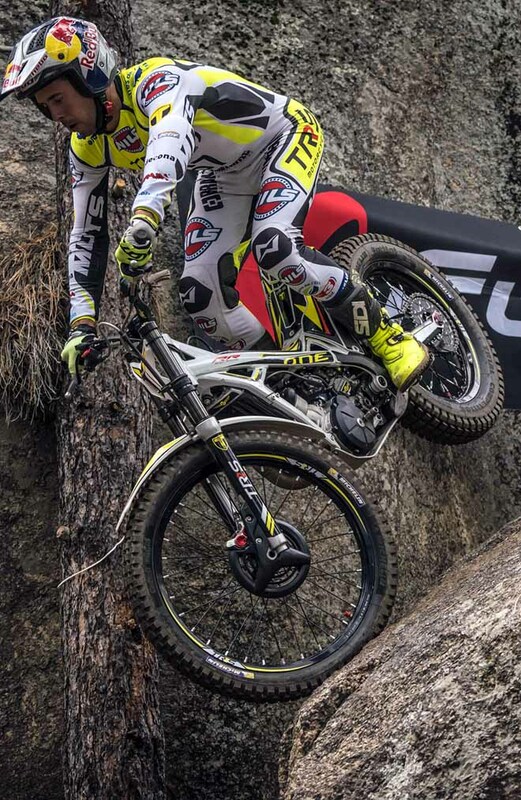 The Spanish legend dominated the premier TrialGP category as true Brit Bristow matched his performance in the TrialGP Women class with both riders recording back-to-back wins. The day started overcast with a threat of rain that thankfully did not materialise, but a heavy overnight downpour made early conditions slippery which, combined with alterations to the sections, resulted in a higher-scoring event. As we have seen time and time again, when the going gets tough Bou gets going and with main championship rival Adam Raga - TRS - dropping to fourth on Sunday the ten-time champion could now secure his eleventh consecutive World title one round early in the Czech Republic in early September. 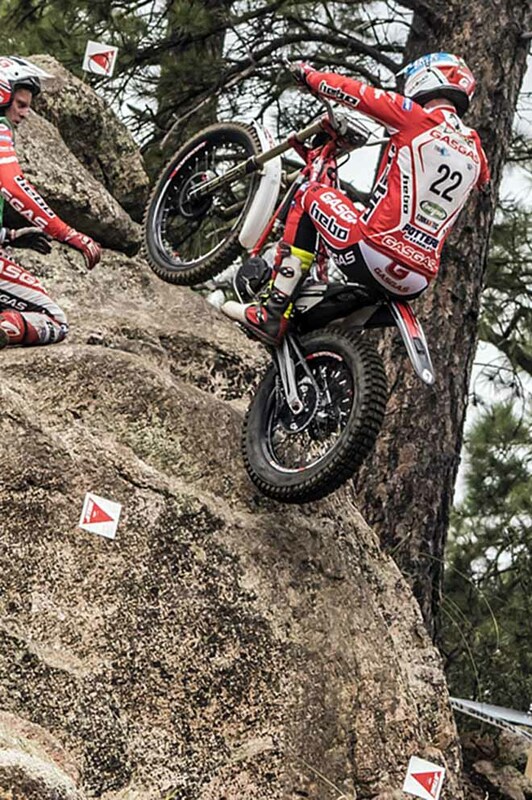 Bou set the benchmark with an opening lap of just three, seven marks less than his Spanish team-mate Jaime Busto who held second at the halfway stage and seventeen ahead of a tie for third between Britain's James Dabill - Gas Gas and Spain's Jeroni Fajardo - Vertigo. 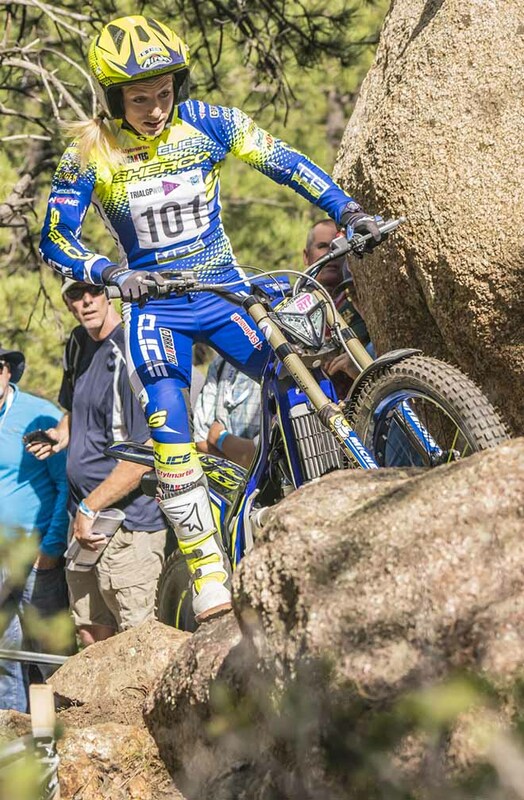 Despite dropping six on lap two thanks to a momentary lapse on section fourteen that resulted in a surprise maximum, the damage had been done and Bou ended the day with a fourteen-mark winning margin over Busto who claimed second to match his career-best finish earlier in the year in Andorra. "I'm really happy about how the Trial went," says Bou. "I am very happy with my riding and it has been a big step forward in the championship - this has been a fantastic weekend." Fajardo's second lap total of just seven earned him the third step of the podium as Raga, fifth after the opening lap on twenty-one, picked up the pace to end the day fourth on a total of thirty. Second-lap maximum scores on sections four and ten saw Dabill slip to fifth on thirty-three with Albert Cabestany - Sherco matching his Saturday performance in sixth on thirty-five. Japan's Takahisa Fujinami - Repsol Honda came home seventh on forty-one after an expensive first lap followed by Italian Matteo Grattarola - Gas Gas on forty-two and Spain's Jorge Casales - Beta on forty-six with another Spaniard, Miquel Gelabert - Sherco, rounding out the top ten on forty-eight. 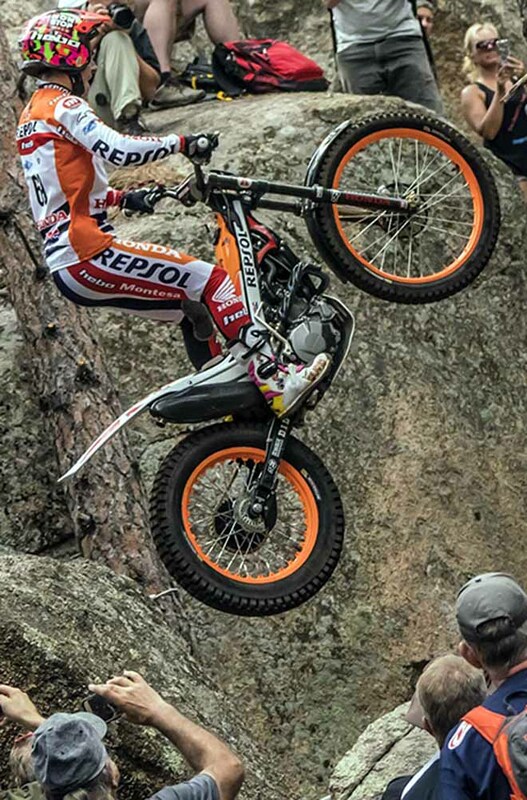 Defending champion Bristow was once again the class act in TrialGP Women as she bids for a fourth World title in a row, following up a first lap total of fourteen with just eight on lap two to beat Spain's Sandra Gomez - Gas Gas into second by a crushing twenty-five marks. "I'm really pleased," says Bristow, "the championship couldn't have started any better. It's good that the sections were more difficult today and I'm over the moon - it's great to get two wins in the bag and I'm looking forward to the next two rounds." "The weekend has been fantastic and I couldn't have wished for a better crowd. Everybody's been so enthusiastic and I'm really pleased we've come over to America - it's been a great experience." Germany's Theresa Bauml - Beta parted with fifty marks to take third and back-up her second-placed finish yesterday as Berta Abellan - Beta dropped a position on her Saturday performance to end the day fourth on fifty-four with fellow Spaniard Mireia Conde - Beta just one mark behind in fifth. 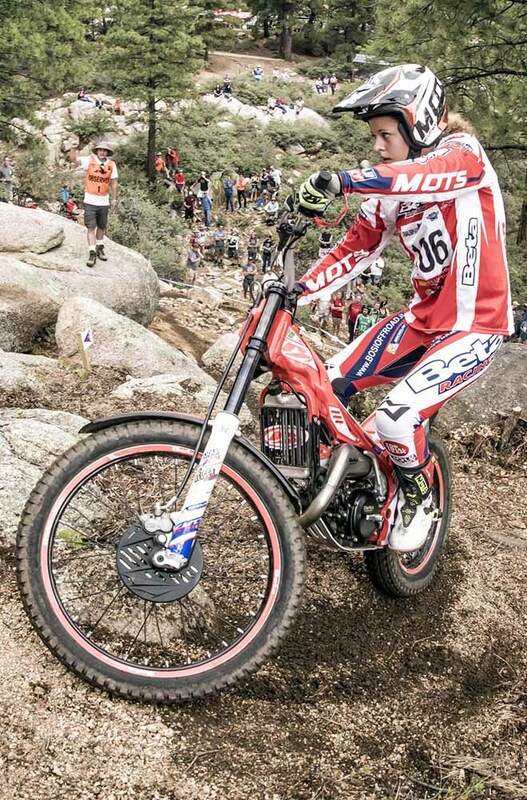 Gabriel Marcelli - Montesa took five more points out of the Trial2 championship lead of Britain's Iwan Roberts - Beta with another dominant performance. Following up his victory on Saturday, the seventeen-year-old Spaniard recorded a total of twenty-one to beat qualification winner Toby Martyn - Vertigo by four marks as his compatriot Roberts beat fellow Brit Dan Peace - Gas Gas for third on a tie-break. With two rounds to go Roberts now leads Marcelli by just seven points to set up a scintillating September showdown in the Czech Republic and Italy. 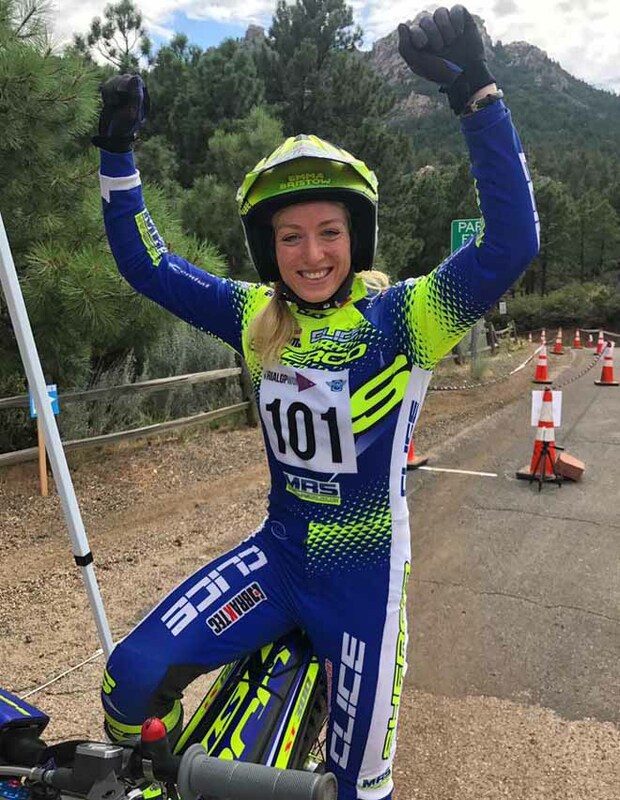 In Trial2 Women the home fans finally had an all-American winner to cheer for as Kylee Sweeten - Sherco - advanced from eighth on Saturday to the top step of the podium on Sunday. 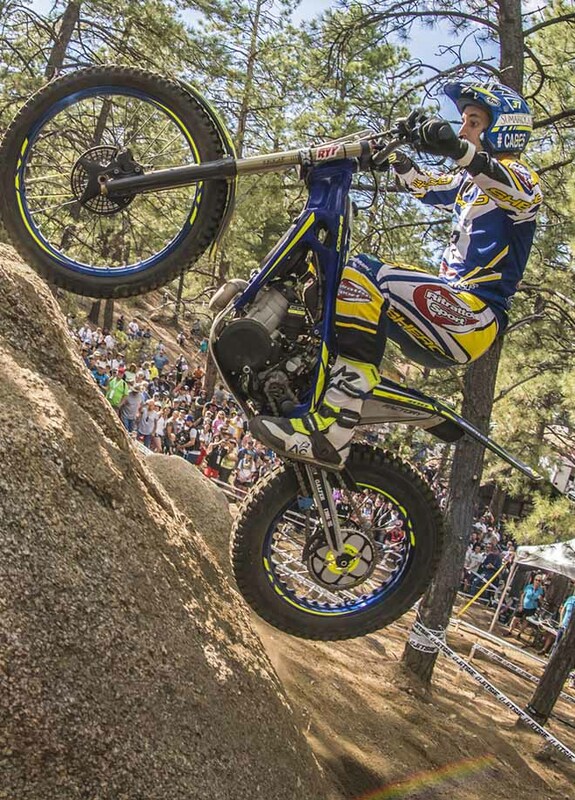 The nineteen-year-old from Oregon City produced the ride of her life to come home first on thirty-eight, five marks ahead of Spain's Carla Caballe - Gas Gas and Norwegian Erika Melchior - Sherco. 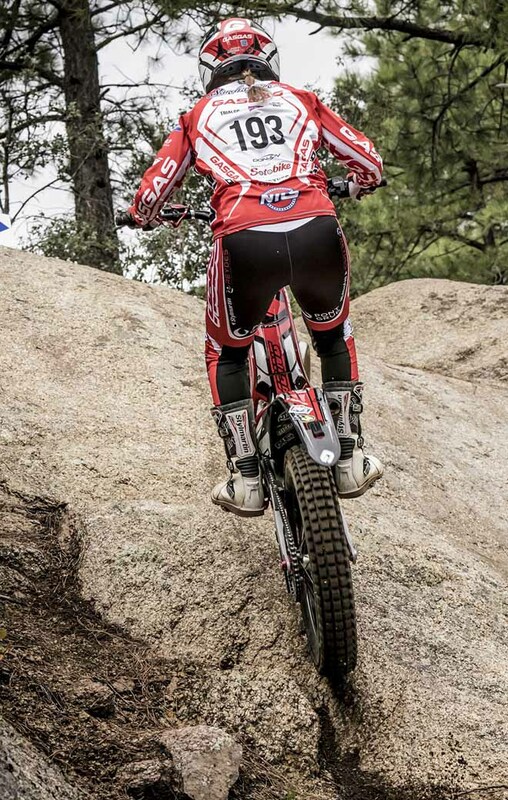 In the championship it is Saturday's winner Neus Murcia - Beta from Spain, who slipped to seventh on Sunday, who leads Sweeten, Melchior and America's Maddy Hoover - Gas Gas by one point. Bou ancora uno scalino più in alto. Molla Raga solo quarto superato da Bustò e da Fajardo. Ora per Raga le speranze di riacciuffare Bou nella corsa al mondiale sono ridottissime. Grattarola ad un passo dal quinto posto, ma due "5" nel finale del secondo giro, dove aveva fatto "0" ed "1" al primo, lo hanno relegato all'ottavo. 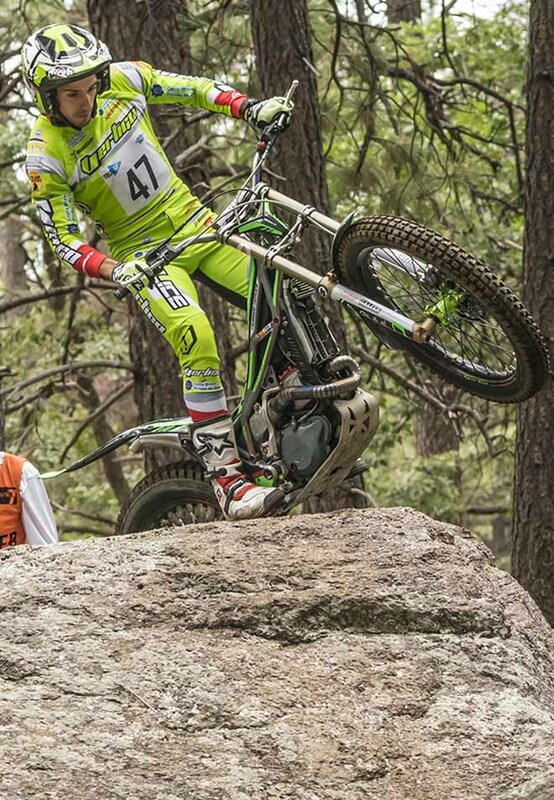 Successo senza sbavature per la Bristow davanti alla Gomez tra le Women Trial GP.Terza la Bauml. Ancora un decimo posto per Sara Trentini decima.